Bhante Sukhacitto is an Insight Dialogue Teacher. 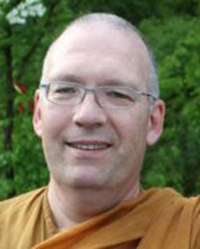 Born in Germany in 1963, he first came into contact with Buddhism in Thailand by attending a meditation retreat, offered through Wat Suan Mokkh, in 1986. He ordained there as a novice in 1989 and as a monk in 1990, returning to the west a few years later. Since then, he has lived at various monasteries, including Dhammapala Monastery in Switzerland and Amaravati Monastery in the UK. On his first Insight Dialogue retreat in 2005, he was amazed by the powerful experience of meditating together with other people, leading him to join many more Insight Dialogue retreats. In 2010, he began his teacher training with Gregory Kramer and others. In his experience, interpersonal meditation is an extremely helpful aid for the development of wholesome qualities. It bridges the gap between traditional silent meditation and our everyday lives, including relationships with others. Bhante Sukhacitto sees Insight Dialogue as an important tool for liberation. Towards this end, in 2016, Bhante Sukhacitto founded Kalyana Mitta Vihara, or "House of Noble Friendship," where relational practice is an integral part of life. View Bhante Sukhacitto's upcoming programs.